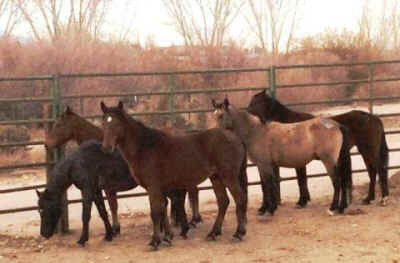 All 31 wild horses have found homes and have been saved from the slaughter auction! And the best news of all -- the families will be placed together! We have some wonderful news to share with you regarding the fate of 31 Virginia Range mustangs who were captured by the Nevada Department of Agriculture (NDA) and are currently being held at the Carson City Prison. 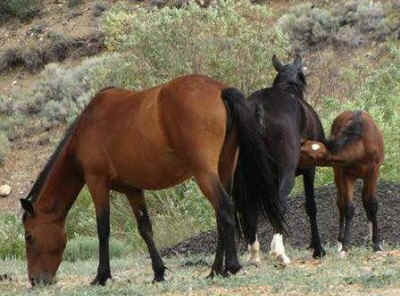 All 31 wild horses have found homes and have been saved from the slaughter auction! And the best news of all -- the families will be placed together! Bond and his family are being adopted by the Reno-based Virginia Range Wild Horse Sanctuary. The "Fernley 10" will have a wonderful life with 650 other rescued wild mustangs at the Mustang Monument Eco Resort and Preserve near Elko, Nevada. The "Lockwood 7" are going to the mountains of eastern Tennessee to the Treadway Equine Animal Rescue Sanctuary (TEARS). The "Stagecoach 6" are headed back to Stagecoach to the Starlight Sanctuary. The "Dayton 3" - including a beautiful blue-eyed, buckskin foal - are being adopted by Steadfast Steeds in Grand Junction, Colorado. Contributions from generous AWHPC supporters have made this rescue possible. This was a true community rescue effort involving Hidden Valley Wild Horse Protection Fund and other coalition partners in Northern Nevada, our founding organization Return to Freedom, the wonderful rescues and sanctuaries that have stepped up to help these horses, and the thousands of AWHPC supporters who spread the word, donated funds and networked to find these horses homes. When we pull together, miracles can happen!